Rian Johnson is still out answering questions about The Last Jedi and just about every little choice that he made in the movie. Johnson and J.J. Abrams have been put under the microscope in an intense way by Star Wars fans who have looked at every frame of the last two movies and now fans want to know why Luke has new Force powers that seemingly come out of nowhere. The topic was being discussed on Twitter and the director stopped by to drop some knowledge and then disappeared. There are SPOILERS for The Last Jedi ahead, read at your own risk. Rian Johnson responded to a Twitter exchange between Bungie project leader Mark Noseworthy and Slash Film head Peter Sciretta. Noseworthy argued that Luke Skywalker's Force powers are foreshadowed by Snoke when he bridged Rey and Kylo, while Sciretta argued that the appearance of the last-minute astral projection in The Last Jedi came out of nowhere. It was decided that Johnson should respond to their Twitter exchange and surprisingly (or not), the director joined the discussion for a moment and then vanished. Rian Johnson's take on the subject of foreshadowing Luke's Force powers or not goes back to the original trilogy. The director took the stance that nothing was ever explicitly explained in the original movies. He had this to say. "I should stay out of this but... were any aspects of force use in the OT (force grabbing objects, force ghosts, even the Jedi mind trick) explicitly "set up" before they happened? I'll take my answer off air." Johnson has taken heat for a lot of his choices that he made in The Last Jedi, but many of them are all rooted from the original trilogy. The Jedi mind trick was never explained, it just was. A fan chimed in on the Twitter conversation to add that Emperor Palpatine used his lightning powers for the first time at the end of Return of the Jedi, which nobody argues about. The magic was just there and it was just believed that someone as powerful as the Emperor could do such things. 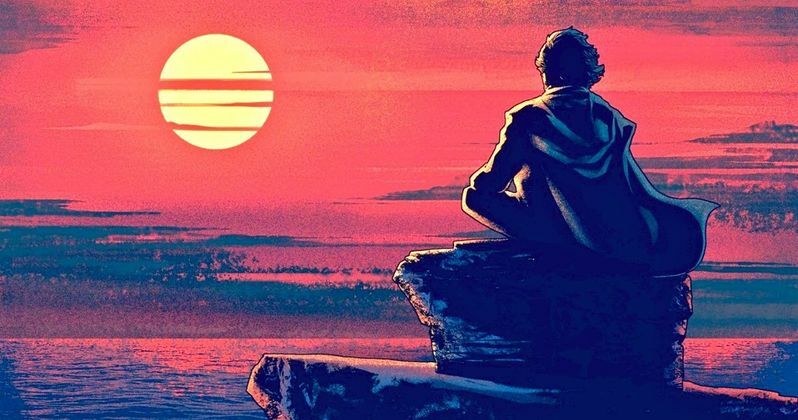 Much like it should be believed that Luke Skywalker can Force-Time a meeting with Kylo Ren on Crait while he's meditating on Ahch-To. Luke is a powerful Jedi Master, so he should be able to do some pretty awesome Jedi tricks by now. Part of dissecting Star Wars movie until you're blue in the face ends up taking a lot of the fun that went into making the movies in the first place, which is something that just happens on a bigger scale these days with the internet. Rian Johnson made a Star Wars movie that was different from what fans knew and he's pretty much gotten trashed for doing so. It will be interesting to see how The Last Jedi stacks up when looked back upon 10 years from now. You can read about the argument over Luke's new Force powers below, courtesy of Rian Johnson's Twitter account.